Do you want to estimate what your remaining equity balance will be a few years out from today? Use this free calculator to help determine your future loan balance. This tool is designed to show you how compounding interest can make the outstanding balance of a reverse mortgage rapidly grow over a period of time. Find the best rates and make your equity work harder! When you reach your golden years, you don’t want to find that you don’t have the income that you had hoped to take all those amazing road trips you planned or to summer overseas or to invest in that vacation home. You want to be able to enjoy every minute of your retirement without having to feel restricted by what is certainly a limited income. Financial planning and investing is the best way to make sure you have the money you need to live the life you always dreamed of during your retirement. The Home Equity Conversion Mortgage (HECM) is a reverse mortgage plan that is designed for homeowners that are 62 or older. You'll apply and get this loan, and it is put on the senior's home as a lien. The senior is either given a lump sum or paid proceeds over time, and as long as the senior lives in the home, there are no repayment obligations. Below are the eligibility requirements and program costs. Mortgage Insurance Premium. Every FHA mortgage requires a MPI, and you can finance this into your loan payment. Origination Fee. This origination fee will compensate your lender and cover their processing fees for your HECM loan. This fee has a cap of $6,000. Third Party Charges. You'll pay closing costs including appraisal, credit checks, mortgage taxes, inspections, surveys, title search, insurance, and miscellaneous fees. Servicing Fee. This servicing fee will go throughout the life of the loan. This fee is capped at $30 or $35 per month. This fee is set aside by the lender and deducted from any funds you have available. The lender will add this fee to your balance each month. 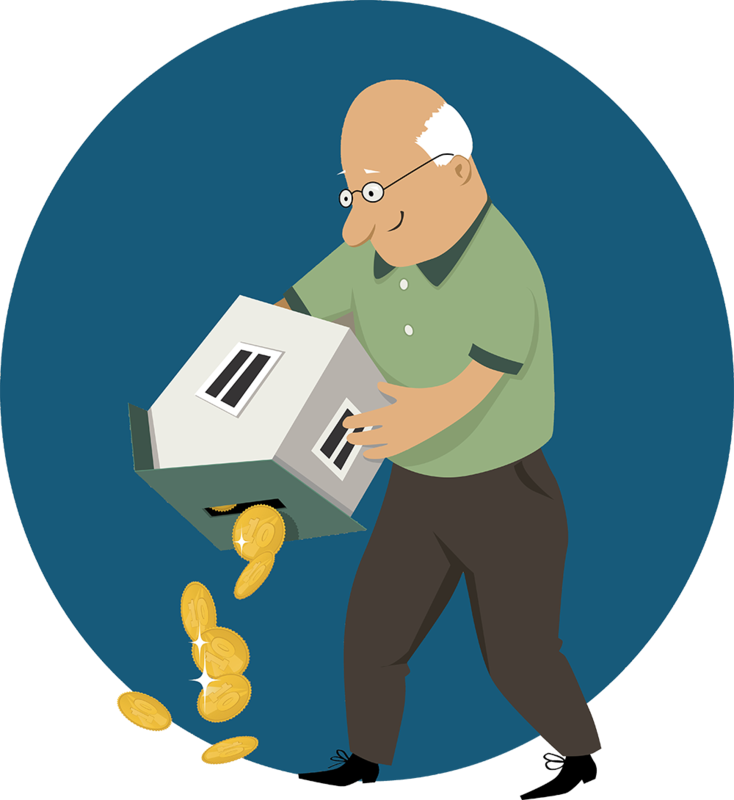 One popular strategy for generating more cash flow during retirement is to take out a reverse mortgage. The name “reverse mortgage” may be a bit misleading. This is not a secondary mortgage you take out on your home that you have to make monthly payments to repay. Instead, it is a line of credit based on the equity in your home that a lender pays to you. With a reverse mortgage, you are getting paid for your home without having to move out of it. You can draw on the line of credit whenever you like, and you don’t have to make payments on it. You repay the amount when you sell your home – or when the home is sold after you die. Think of it like the bank pre-paying for your home before you have actually moved out of it. Some reverse mortgages, known as single-purpose reverse mortgages, are limited to use for home repairs or property taxes only, and may be limited according to the homeowner’s income. However, the vast majority of reverse mortgages are issued at Home Equity Conversion Mortgages, or HECMs, which are awarded based on the value of the home. After widespread appraisal issues (where appraisers overstated the value of the homes receiving reverse mortgages to enable larger loans) the FHA began requiring a second appraisal on loans where they felt valuations were inflated to reduce risks to the Mutual Mortgage Insurance Fund . “It did dawn on us that we have a higher appraisal on the front end," he continued. "Given the nature of the reverse product, where the properties tend to deteriorate more, obviously we’re talking about senior citizens, and then now the product is worth less after the life event. We’re almost maybe feeling that pain twice." Some reverse mortgages may allow you to draw on the line of credit whenever you like, but others may provide fixed monthly payments either for a specified period of time or until you die. The monthly payments are not taxable. Many retirees may like the idea of getting money for the equity in their home, but they may not like the fact that they won’t be able to leave their home to their heirs without also passing along a lot of debt if they choose a reverse mortgage. Several other investment strategies are available to prepare for your retirement and ensure that you continue to own your home free and clear. Stocks, bonds, mutual funds, 401(k) accounts, Roth IRAs, fixed and variable annuities and other investments can all help you to diversify your income stream. The best part is that you don’t have to invest a sizable portion of money all at once in order to see big gains. Simply making consistent contributions over the years, even if they are small, can help you to build a large portfolio from which to draw when you retire. We offer this free calculator to help you understand how your contributions over time can meet your financial goals for retirement. Just plug in your starting amount and how long you plan to save, then experiment with the rate of return, annual contributions, frequency and interest to determine how much money you can make. Your financial analysis will quickly reveal the changes you need to make to reach your financial goals, either by increasing the contribution amount or frequency, or by finding higher-yield investments. Just plug in your information, and a plain-English analysis will be sent to your e-mail within moments.